Over on Facebook, a fan named Jim George shared a great story about meeting John Lennon at the Helping Hands Marathon in 1975 and getting John's autograph in 1979. 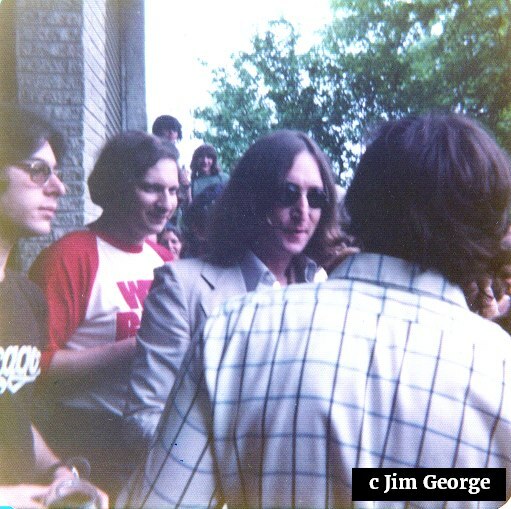 I asked Jim if I could share his story and photos on this blog and he told me it would be fine to share, so here is his great story of meeting John Lennon. Thank you Jim! In May 1975, one of the last official public appearances John made was a three-day radio marathon at WFIL in Philly. During that weekend, he would come out to the parking lot every other hour and sign autographs while station staffers would collect change for the charity. Expecting massive crowds, a friend and I were skeptical that we'd get anywhere near him, but we decided to take the chance anyway and went on the final day, Sunday. The first time John came out to the lot, which had a railing around it as kind of a buffer zone, I was right near the exit and as he approached the crowd, my immediate response was to extend a hand. 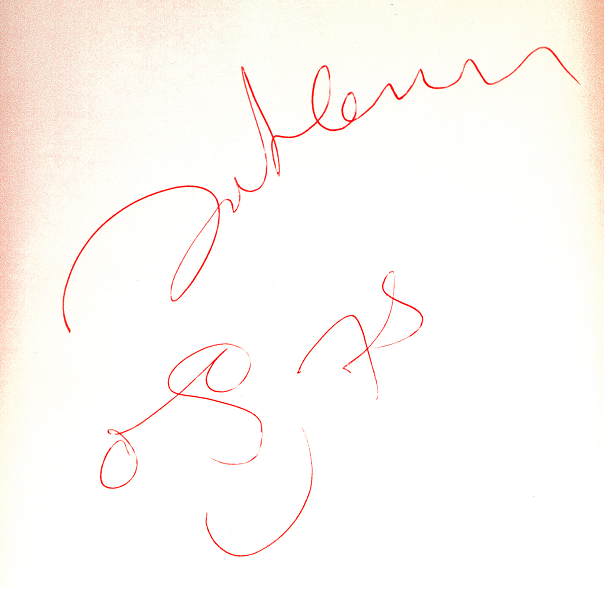 He walked straight to me and shook my hand, though he seemed a bit surprised, probably because, as I observed later, most people there merely handed him an item to sign--a photo, a record sleeve, a Rickenbacker guitar. There wasn't a whole lotta shakin' goin' on. Each time he came out, he went around the parking lot twice, so I ended up with four signatures. Foolishly--and possibly due to our low expectations--I hadn't come prepared with any choice memorabilia, only paper: an index card, a manila envelope, two sheets of typing paper. But they're authentic. In his own write. "I did get to shake your handshake, but I was just another shaky hand in the crowd (the one without warts)." 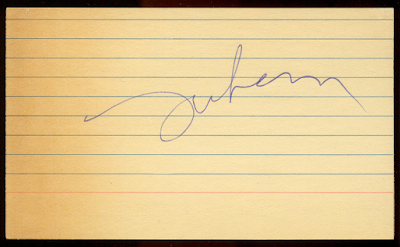 Jim's 1979 autograph is very interesting because John signed it on a bookmark sent to him by Tony Saks. You might recall that Tony Saks was the man who owned the "only guitar signed by the Beatles." (although the authenticity of said guitar's autographs is up for debate). By 1979, Tony was hitting the convention circuits and seemed to have a habit of sending things to the Dakota building. I own a large envelope from 1985 that Tony had sent to Yoko that ended up in the dead letter office. How it came to be in an auction is beyond me, but I now have it. But we can see that Tony sent what I would assume was another packet of information about himself to John in 1979. When answering fan mail during those days, John would often just sign whatever he had available and send it back to the fan. And or Jim George, he signed a bookmark that had been sent to him by noneother than Tony Saks. Thanks for including my anecdote, Sara. I always figured that John just grabbed whatever was near and signed it, but I never knew the Tony Saks backstory, so this was very interesting to learn! PS. The most frustrating thing is that someone somewhere probably has a photo of me next to John--or even shaking his hand--because cameras were clicking constantly. I keep looking, but I may never find one. I was in the parking lot on the 2nd day of the Marathon. I waited a long time for John like everybody else.I bought an autograph off an employee for a dollar.When John finally came out I got his autograph on a piece of paper. I remember him saying to us....."Don't push now" Well the stupid thing I did was bring it to school on Monday and show it off to people. I was a junior in high school at the time. That afternoon I missed my school bus so I thumbed it home from school(Back then it was safe. 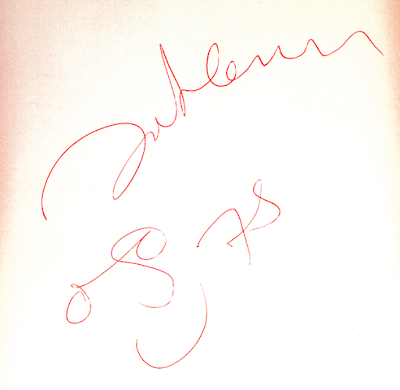 While standing at an intersection a gust of wind blew open my school book and blew the autograph into a creek(Mill Creek) So my John Lennon autograph wound up in a creek and eventually the Delaware River. I had a tantrum when it happened, you can't blame me. I just couldn't leave well enough alone I had to bring it to school to show off.